And I'm running it in max settings. The really annoying thing that makes it hard to test is that it doesn't happen every time (AC130 does, but unfortunately I don't get it every time). And by crash I mean fully crash, it doesn't send me to the desktop, both screens go blank and I have to turn off and back on the computer. Any suggestion is extremely welcome, even if it's just a way to reproduce the problem every time would help me a lot for testing purposes. It usually happens on explosions (cars, concussive, AC130 big gun) but it's not limited to that, sometimes it happens out of nowhere, other times when game starts or ends. I'll post more details as I remember them. By changing the game's sound from "Windows Default" to "Stereo" I was able to reduce the occurrence of this problem to once every 3 to 5 hours, however, the problem persists. If is a clue to anyone, your advice is really appreciated. Thanks. The computer has rebooted from a bugcheck. The bugcheck was: 0x00000116 (0xfffffa800addb4e0, 0xfffff8800fa0afa4, 0xffffffffc000009a, 0x0000000000000004). A dump was saved in: C:\Windows\MEMORY.DMP. Report Id: . (Critical)The system has rebooted without cleanly shutting down first. 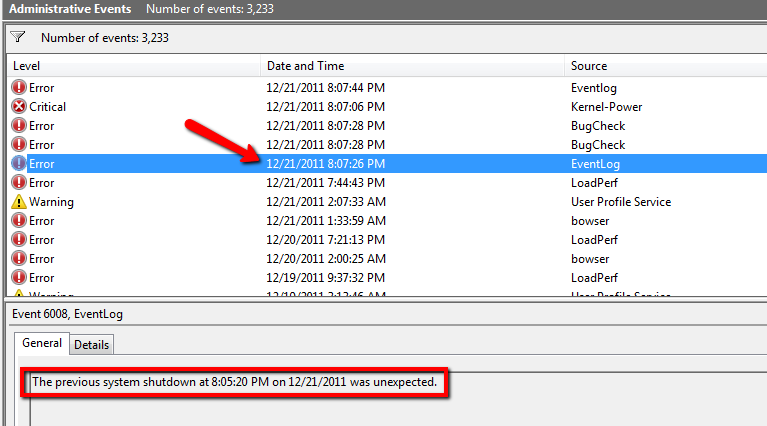 This error could be caused if the system stopped responding, crashed, or lost power unexpectedly. So the bounty is about to end, and I didn't get any conclusive solution. I will keep trying to fix this, and will post my solution once I'm find the solution. I hope this helps anyone have the same problem. Thanks for everyone's time, you guys have been really helpful, I will let you all know when this is fixed. It was a strange form overheating. I call it strange because it crashes soon after it gets to 80 degrees, but I've played other games (Startcraft 2 for example) at around 86 degrees without problems, which is why I disregarded this possibility right away. Lately I've been setting the GPU fan to spin as fast as it can using MSI Afterburner, and I haven't had any crash since. I was able to set back the audio to Dolby 5.1, put back the steam overlay and everything. So I can happily play now. Thanks everyone for all your help, I learned a lot from this experience, and although the problem and solution were somewhat simple (except for the fact that other games run all right when the GPU is warmer) I hope it helps others having any issue addressed here. Thanks again and happy gaming. Updating your graphics drivers. I think there was a special release for the BF3 beta recently that caused issues with MW3 at launch. Even if you've updated recently, check for a newer revision. Beyond that I'm afraid I don't know - there's so many tiny things that can go terribly wrong with a recent game and an individual PC setup that I'm not sure how to advise you in your current situation. I note that you're overclocking, if you stop, does that help any? That's the first thing I try if I'm having an issue of any type while overclocking. Even though everything checked out normally, it turns out that somehow my memory has gone bad (despite passing all memtests!). I eventually figured this out by placing only one stick of memory into my system at a time, and it would constantly crash with one stick but not the other. Ever since I replaced my memory I've had no problems with my system. The only other thing I can offer is to check the voltage levels for your memory and other components. Some motherboards set the default voltage levels to be too low/high for certain types of memory, which can cause them to burn out faster. (I suspect this is what happened to my machine). Just to definitively rule out overheating, I'd open the case and place a large house fan blowing directly on the open side of the PC at full blast. If you still get the crash in that scenario, then excess heat cannot be the reason why. The rule of thumb here is to go for lower settings as they are less of an impact, so try 24 bit, 44100 Hz as well as 16 bit, 48000 Hz and 16 bit, 44100 Hz. At least try the two values involving 44100 Hz because these should really be working. 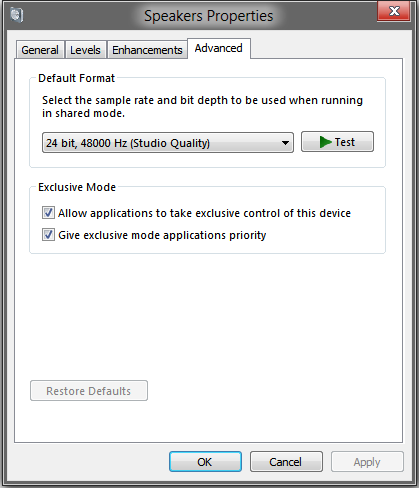 It might be that Modern Warfare 3 has problems with your specific audio card driver and its format settings. Changing the type of sound seems from non-Stereo to Stereo settings already made the impact on the Sound card lower, so changing the format might have additional relieving effects. You might also want to check that all sound effects are disabled on the Enhancements tab and / or that it is set to an immediate mode. 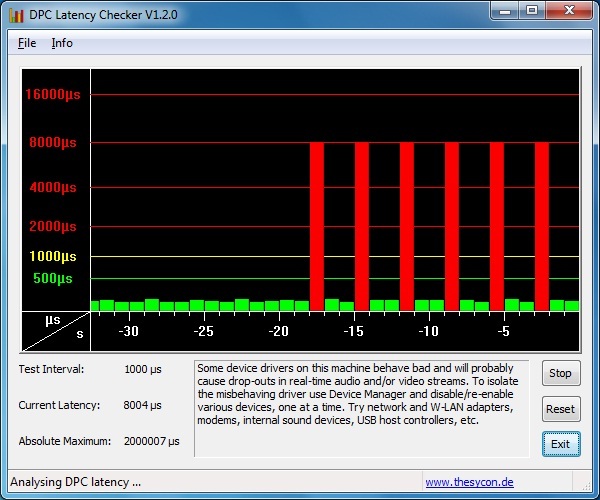 Again, to ensure that the load on your audio card is decreased, the latency is low and the buffers don't get fill because there is something slow. This is a mega long shot, but a similar thing used to happen to me whenever I played CSS, about an hour in, with no warning, regardless of graphics settings, the game would freeze and I'd hear the "n-n-n-n-n-n" you described of audio looping. Brand new computer, first game I installed. It was the only game that caused this error. I always thought it was a heat issue as well, but if it's not running higher than other games, than I doubt it is. I never figured it out until I got into the APB beta, and had the same issue. I e-mailed their support team and gave all the details I could. They told me to update my BIOS drivers. I don't know why it solved the problem but it did, and I haven't had the issue since. **I would have posted this just as a comment, but I registered just to offer this advice. Also I noticed you said at the end of games and in AC-130's, the screen goes mostly black and white at these points. I don't know if that could have something to do with it. To recreate it, create a private match and get a friend to spawn with tac insertions so you can quickly farm an AC-130? I had an issue very similar with a machine with the GeForce GTX 570ti and after struggling through various suggestions on the EVGA forums, the core of it came down to the annoying way NVIDIA drivers include sound device drivers. An uninstall (you need to fully clear them out) and a selective reinstall of the latest approved 570 drivers sorted out that issue. You made note of an update to windows and skype that happened about the same time as the problem. try rolling back to before the windows update and then make sure skype is not running in the task manager. and see if the problem keeps happening. no matter what you do its going to happen. there is nothing u can do about it. I am a mw3 survival player and my game crashes at around 150 wave(which usually takes 8-10 hours). Its because the pc is unable to render all the graphics items like sound, explosions, choppers etc. What you can try is go to the settings of the game and reduce the volume to 0% when you get into the scenario where lot of things happening and then bring it back on to whatever suits you...worked for me couple of times. Rest there is no possible solution we as in all the survival players could find. Not the answer you're looking for? Browse other questions tagged pc call-of-duty-modern-warfare-3 or ask your own question. Is my video game destroying my computer? Could I load the Playstation OS on a computer hard drive, and play with a controller? Why won't GTA V launch?